QTerminal is the default terminal of Lubuntu that also has a drop down version. To open a new tab go to the File ‣ New Tab or press control + shift + t. To close a tab press the X button near the right hand side of the tab. You can change between tabs by left clicking on the tabbar on the tab you want to switch to. If you want to switch between tabs click on the different click on that tab or press the left and right arrows in the upper right corner on the tabbar. Another way to switch between tabs is control + page up or control + page down. If you want to copy text from the terminal press control + shift + c or Edit ‣ Copy selection to copy text. If you wish to paste text into the terminal you can control + shift + v or Edit ‣ Paste Clipboard however you should be really careful it is not a malicious command and shows the command you are pasting in. If you want to paste selected text in the terminal press Shift + Insert or Edit ‣ Paste Selection. 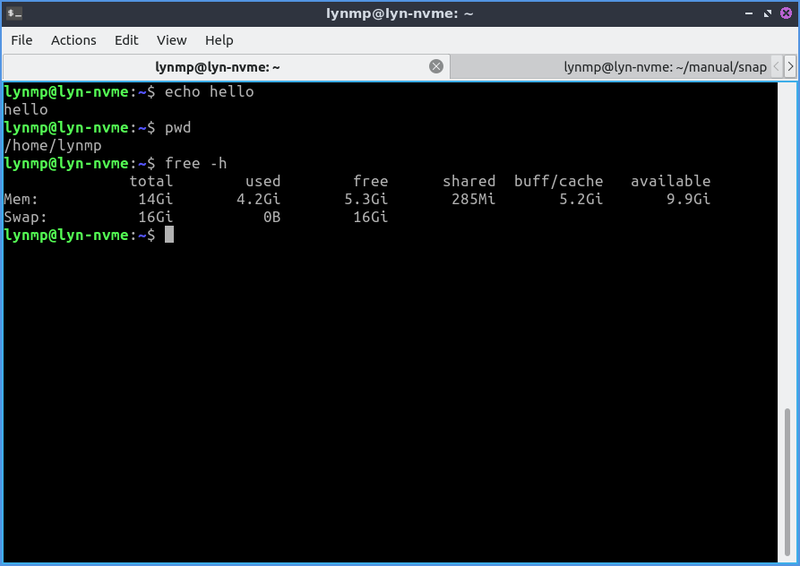 If you want to open a new terminal window Control+ Shift+ N or go File ‣ New Window. To try to autocomplete the command you type in a command line press the Tab key. If you get a url in your terminal you can right click Copy Link Address to copy the link. To open your link directly press Control + left click or right click the link and select Open Link. To zoom in on the terminal press Control + Shift + + or right click and select Zoom in. To zoom out press Control + - or right click Zoom out. To return to the original zoom press Control + 0 or right click Zoom reset. If you want qterminal to be fullscreen press F11 or View ‣ Fullscreen to make it fullscreen then F11 or View ‣ fullscreen again to make it back to its original size. To split your terminal vertically into two terminals on top of each other Actions ‣ Split Terminal Horizontal. To have one split terminal to the left and one to the right Actions ‣ Split Terminal Vertically. To collpase back to how your terminal back to how they were before Actions ‣ Collapse Subterminal. To switch between the two split terminals click on the terminal you want. To switch to a the lower split terminal press Alt + Down or Actions ‣ Bottom Subterminal. To switch the the top subterminal press Alt + Up or Actions ‣ Top Subterminal. To switch to the left subterminal press Alt +Left or Actions ‣ Left Subterminal. To switch to the right subterminal press Alt +Right or Actions ‣ Right Subterminal. To change to the next tab using the keyboard press Control + Page Down or Actions ‣ Next tab. To change to the previous tab using the keyobard press Control+ Page up or Actions ‣ Previous Tab. To move to a tab to the right Actions ‣ Move tab to the right. To move a tab to the left Actions ‣ Move tab to the left. To bring a search for the text displayed on your terminal press Control +Shift +F or Actions ‣ Find…. To close the search bar press Escape or Control+Shift+F again. To find what you need to search for in the Find search bar. To move to the next result press the rightward pointing arrow button. To move to the previous result is to press the leftward pointing arrow. To change to not to match case press the downward pointing arrow button uncheck the Match Case checkbox. To toggle highlighting all matches check/uncheck the Highlight all matches checkbox. To use a regular expression click the downard pointing arrow button and check the Regular expression checkbox. To clear you active terminal press Control + Shift +X or Actions ‣ Clear Active Terminal. To hide window borders check the View ‣ Hide Window borders. To change your preferences go to File ‣ Preferences or right click the terminal and Prefrences. To change your font press the Change button next to the font label. The Color scheme field lets you say change how different colored things in the terminal colors appear. The Widget style lets you overwrite the system widget style with something other than system default. The Scrollbar position lets you move the scrollbar to the left or right or remove it entirely. The Tabs position moves the bar to that part of the window of qterminal. The Keyboard cursor shape changes the shape of the cursor between block cursor a large block, underline cursor a small underline, or IBeamCursor which is quite small like a | character. To toggle showing the menubar check/uncheck the Show the menubar checkbox. The checkbox Hide tab bar with only one tab hides the tab bar when you only have one tab. The checkbox Limit tab width limits how wide a tab would be how be and the filed next to it is how wide to limit the width of tabs.The Show a border around the current terminal shows a border around the terminal. The checkbox Show terminal size on resize toggles showing the terminal size on resizing the window. To have support for languages with both right to left and left to right text check the Enable bi-directional text support. The field Application transparency gives you the percent transparent for the full application transparency. The field Terminal transparency is how transparent to make the terminal. Note you will need to enable the compton compositor for this function properly. 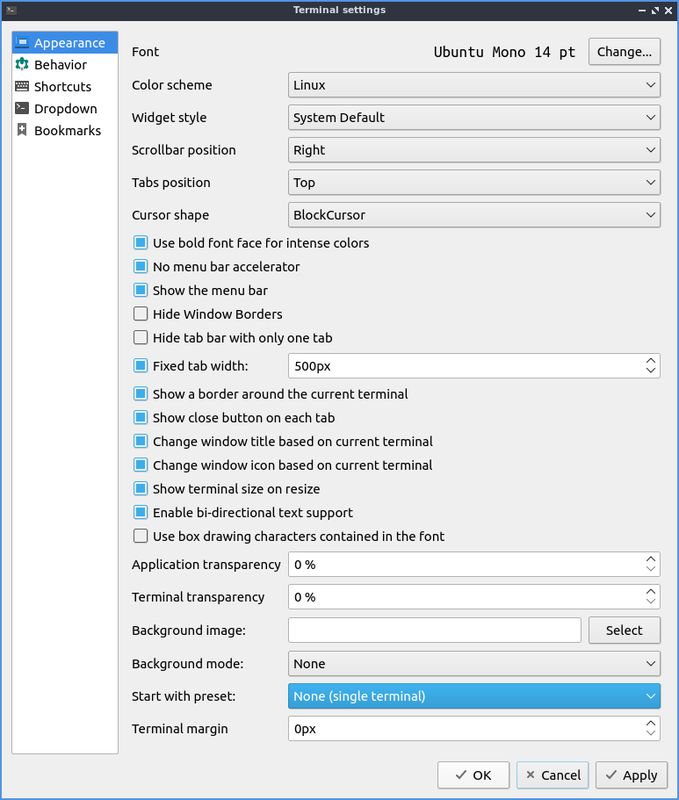 To select a background image for your terminal press the Select button next to Background image:. The field Start with preset lets you choose how many terminal splits to have when you start up QTerminal.To have a margin on the left side of the terminal set the Terminal margin will show the marginal in the terminal in pixels. To apply these changes to see how they appear on QTerminal press the Apply button. If you like your new customized terminal layout press the OK button or if you wish to cancel your changes press the Cancel button. The Behavior tab changes history, pasting, and different kinds of emulation. The button for Unlimited history will save an unlimited amount of history. The History size (in lines) lets you save only that many lines of history. The checkbox for Confirm multiline paste brings up a confirmation for pasting multiple lines. The checkbox Trim trailing newlines in pasted text removes excess newlines in pasting text from the end of what you paste. The Ask for confirmation when closing pops up a confirmation dialog when you close qterminal. The checkbox Save position when closing saves the position when closing qterminal. The Open new terminals in current working directory checkbox open new terminals in the last working directory you were on. The Shortcuts tab shows all the different shortcuts and how to change keyboard shortcuts. The Shortcut column shows what the keyboard shortcut does. The Key column is the keyboard shortcut to launch the shortcut. To change or add a keyboard shortcut double click under the Key column and then press the keyboard shortcut you want. To change how you sort your keyboard shortcuts left click on the column to sort in a different order. The Dropdown tab shows effects on the appearance for the drop down settings of qterminal. The Show on start checkbox shows the drop down terminal if checked and if unchecked it will be hidden at the start. The Height field shows the height of the drop down terminal. The Width field shows how wide to make the dropdown terminal. The field Shortcut is the shortcut to bring down the drop down terminal and to change the shortcut type in a different key. Lubuntu ships with version 0.14.1 of QTerminal. from the command line. You can also launch qterminal by pressing the keyboard shortcut Control+Alt+T.